First of all, I had honestly never heard of a Jibarito before, but when the good people of PRE® Brands told me about it, I was a sold. 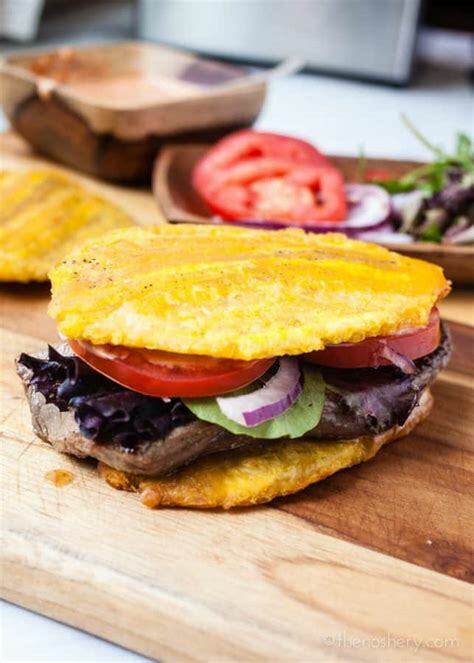 A Whole30 compliant steak sandwich made with plantains as buns? How could you say no to that? Not only does this sound delicious, it IS really delicious. I’ve actually been making tostones a lot these days (which I’ll have to post a recipe for soon) and these buns are basically very large tostones. The second reason I am excited to bring you this recipe is that I’m psyched about my newest meat discovery, PRE. PRE makes grass-fed (& finished! ), pasture raised, antibiotic and hormone free meat that tastes absolutely incredible. I have to admit, I normally can’t really tell most meat apart. As long as it’s good quality, normally it tastes fine to me. However, after trying PRE, I now honestly realize what good meat actually tastes like. I know it sounds cheesy, but you can absolutely taste the difference with this stuff. Apparently they even have something called the Taste Standard, so I guess I shouldn’t be surprised it tastes so good. Not only does this meat taste good, but the texture of the steak is unreal. Especially the cut I use in this recipe, the NY Strip, it no joke melts in your mouth. Not only is the taste and quality incredible, but the packaging is pretty much revolutionary. You’ll have to find some of my videos on IG stories, but PRE has mastered the art of packaging meat in plastic that actually opens when you try to peel the edges apart (no knife needed) AND you can easily drop the meat onto a cutting board or into a pan without touching it all which means no need to wash your hands. How did no one think of this before?! If you want to check out PRE, you can find them in stores in the midwest/East Coast or online here! Peel both green plantains by slicing off each end and then using the knife to create an incision in the peel vertically, carefully peeling it off the plantain. Cut the plantain in half horizontally. Heat 2 tablespoons coconut oil in a cast iron skillet until hot but not smoking. Gently place plantains in the oil and cook each side for a couple minutes until golden brown, but not fully browned. Remove from the heat and set on a cutting board. Turn the heat off on the stove temporarily. Using a heavy plate or the bottom of a pan, gently smash the plantains until they are ¼ inch thick. Turn the pan back on and add the plantains back into the oil to cook for another couple minutes on either side until crispy on both sides. While the plantains cook, prepare the steak by removing it from the packaging and drying with a paper towel. Place some plastic wrap over the steak and tenderize until ½ inch thick. Add ½ teaspoon taco seasoning to each side of the steak. Remove the plantains from oil and turn off the stove. Pour oil or carefully or wipe out any remaining oil from the pan and return it to the stove to cook the steak. Cook the steak for a few minutes on each side on medium heat. The steak will cook pretty quickly so watch it carefully. Remove the steak from the pan and allow to rest while you prepare the remaining ingredients. Carefully assemble your sandwich by placing one of the plantain buns down first, followed by some mayo. Slice the tomato, avocado and onion. Once the steak has rested for a few minutes, add the steak on top of the mayo, followed by the tomato, onion, avocado and spinach or lettuce. 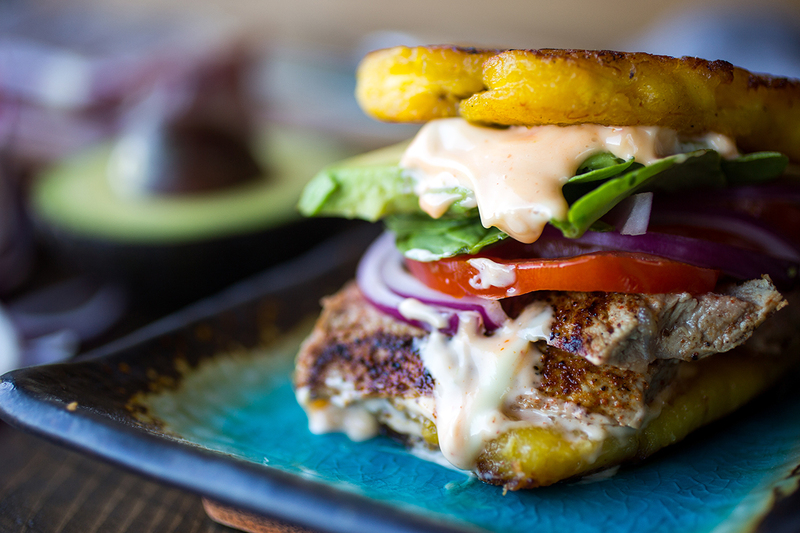 Add a little more mayo to the top plantain bun and add on top. Disclosure: I received products and payment from PRE Brands as compensation for this post, and PRE Brands did not influence my opinion of this or any other product. All views and opinions expressed in the post are my own and no other compensation was provided. I’m a sucker for anything having to do with plantains! This looks delish!